Does your smile need plumping? Are you sick of thin or poorly-defined lips? Non-surgical Lip Enhancement is suitable for anyone who would like fuller lips. 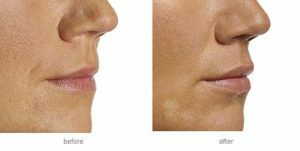 The safe, efficient lip enhancement procedure can replace the volume and definition that ageing has taken away; it can also be used to create balance between the upper and lower lip. We are known for our ‘natural’ look with lip enhancement. Dermal fillers are used to enhance the overall volume of the lips. They can also be inserted around the lip edge, this helps improve the contouring and shaping of the lips. In all Malmin Skin Clinic treatments, we only use only hyaluronic acid dermal fillers from the Juvederm range. These fillers have been rigorously tested and have been deemed to be very safe. We can adjust the amount of lip filler to suit the individual requirement of each patient. All lip enhancement treatment will only be administered by a highly qualified cosmetic medical doctor. We also provide an aftercare program, to help you to adjust and look after your newly enhanced lips. Prior to starting your treatment, your doctor will discuss the price of the treatment required. Our prices depend on the amount of product used for each treatment and it is charged per syringe.